Born in Madras, Tamil Nadu. 1981 Jury Member, National Exhb., Lalit Kala Akademi, New Delhi. 1985 Participated in the Indian Festival of Print Workshop, San Diego State University, California. 1986 Commissioner of Indian Section, 6th Triennale, Lalit Kala Akademi, New Delhi. 1987 Honorary Secretary, Lalit Kala Akademi, Madras. 2000, 02 Eminent Artist, Lalit Kala Akademi, New Delhi. 2002 Member, All India Council for Technical Education. 2002 Chairman, Lalit Kala Akademi, New Delhi. Lives and works in Chennai. 1959-64 Studied at Govt. College of Arts and Crafts , Madras. 1964 Training in Fresco Techniques, Bhanasthali Vidyapith College, Rajasthan. 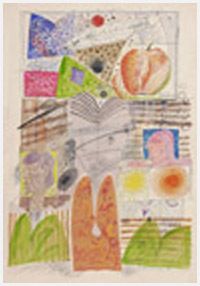 1968 Studied intaglio, lithography and ceramics, Ein-Hod Israel, UNESCO. 1976-77 Post graduation in print making, Portsmouth Polytechnic, England. 1966, 68, 69, 72, 81, 84, 93 Solo exhb., Madras. 1968, 73, 77, 84, 86, 90, 92, 95, 98, 2001 Solo exhb., Bombay. 1968 Solo exhb., Tel Aviv, Israel and Jerusalem. 1978, 81, 86, 91, 2001 Solo exhb., Bangalore. 1989 Solo exhb., Calcutta. 1992, 2001 Solo exhb., New Delhi. 1971 Solo exhb., Suva. 1977 Solo exhb., United Kingdom and Holland. 1978 Pictorial Space, curated by Geeta Kapur, LKA, New Delhi. 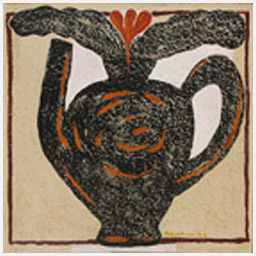 1980 Exhb., Miniature Format Painting, Lalit Kala Akademi, New Delhi. 1985 Festival of India, A Print Making Show, USA. 1985 Mostra de Culture Indianna, Lisbon and Bonn. 1992 Jubilee exhb., Birla Academy of Art and Culture, Calcutta. 2004 Manifestations II, organised by Delhi Art Gallery, Jehangir Art Gallery, Mumbai and Delhi Art Gallery, New Delhi. 2005 Manifestations III, organised by Delhi Art Gallery, Nehru Center, Mumbai and Lalit Kala Akademi, New Delhi. Karnataka Chitrakala Parishath, Bangalore. Sarlas Art Centre, Chennai. Contemporary Art Gallery, The National Art Gallery, Chennai. National Gallery of Modern Art, New Delhi. Lalit Kala Akademi, New Delhi. Tamil University, Thanjavur. South Zone Cultural Centre, Thanjavur. Bharat Bhavan, Bhopal. Lalit Kala Akademi, Chennai. Punjab Museum, Chandigarh. British Council, London and Southampton. Portsmouth Polytechnic Museum, England. Dugit Art Gallery, Tel Aviv. Artists Centre, Jerusalem. Bank of Baroda, Fiji. San Diego State University, California. Kansas State University, Kansas. Library of Congress, USA. Gallery Sara Arakkal, Bangalore. Delhi Art Gallery, New Delhi. 1968 Scholarship from International Association of Plastic Arts, UNESCO. 1976-77 Awarded scholarship from British Council, New Delhi. 1979, 81, 84, 86 Awarded Fellowship by the Department of Culture, Ministry of Education, New Delhi. 1982 National Award, Lalit Kala Akademi, New Delhi. The linearity and strong sense of colour that is characteristic of the South Indian artists bursts out of this brilliant early work by Bhaskaran. What is certain is that the vitality Bhaskaran has infused into the composition is entirely his own. In his later pictures, Bhaskarans studies of Cats or of his Marriage Portraits or of his charged landscapes, where figures merge into voluptuous tree-forms that pulsate with lines, dots, geometric notations against a tense background of colour, always seem to swirl with energy. Perhaps this is to make up for the long hours spent making the carefully layered prints that have been a Bhaskaran specialty. 1995 Principal, Govt. College of Arts and Crafts, Kumbakonam. 1997-2001 Principal, Govt. College of Arts and Crafts, Chennai. 2003 Lecture tour to Vietnam.